The Mommy Orphanage presents a unique twist on the international adoption story. While many children’s adoption stories are told from the point of view of parents as they portray the story of their journey to bring their new baby home, The Mommy Orphanage unfolds from a child’s perspective. When faced with this choice, Emily explains that she already has the best mom; the mom who knows and loves her best–HER mom. Even if she could choose from a multitude of great moms; some who offer presents or even look like her, the mom she wants, is the mom she has. The target audiences of the book are children ages 5-8, adopted internationally from China or other countries. Children at this age typically understand their basic adoption story, and strive to understand their beginnings while strengthening bonds and attachment to their parents. The Mommy Orphanage presents an opportunity to discuss these feelings. At times silly, and at times touching, The Mommy Orphanage is sure to delight children and parents alike. 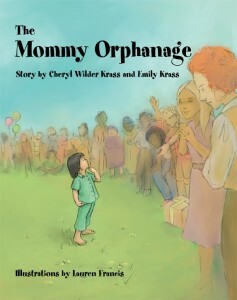 The Mommy Orphanage was created by the mother and daughter team of Cheryl and Emily Krass. When Emily was five years old, she created the concept of a Mommy Orphanage and Cheryl expanded it into a book. Cheryl loved the unusual twist of the story and just knew it needed to be shared. Emily was born in 2001 in the Guangdong Province of China in a city called Gaozhou. She spent the first 9 months of her life living in an orphanage called the Gaozhou Social Welfare Institute. In June of 2002, her parents Cheryl and Louis Krass, along with big brother Alex (who was 10 at the time), traveled to China to adopt Emily and bring her home to her new family. After they decided to write the book, Cheryl researched a number of traditional publishing options. She decided that she really wanted control over the look of the book, and it was important to her that it be published a lot sooner than traditional paths would have allowed. The decision was obvious – the creation of Alexemi Publishing. While searching for an illustrator, Cheryl discovered the website of the amazingly talented Lauren Francis. She was impressed by Lauren’s diverse style of illustration and the depth of her characters, and asked her if she would be interested in the project. Lauren had wanted to work on an adoption-related book so she agreed to take it on. Cheryl sent Lauren a couple of photos of Emily and her, and Lauren based the characters in the book on real “characters”; right down to the cat.